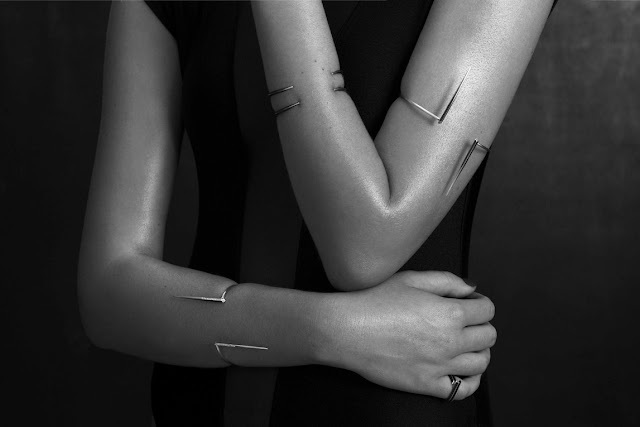 Vamp-ish, sensual and darkly intriguing, Adi Lev's design philosophy derives from the taboo attraction of the forbidden worlds of body modification and fetishism, evoking a sense of danger and innate curiosity of the darker self. The Shape of Ink collection creates jewellery for the most unusual of places, yet they are areas most commonly used for jewellery; mouth, nose, ears, neck and arms, however the collection depicts jewellery that evolutionise the whole concept of adornment, accentuating or creating new areas of the body that was previously unnoticeable. Visibly lethal and weaponry, the collection forms a sharp contrast to the natural curvature of the female form, forging a rather menacing yet intimately intimidating aesthetic. The geometric and minimalist collection features jewellery hovering just above the surface, creating a complex three-dimensional structures to the contour of the body that symbolises its unlimited potential. Adi Lev certainly revamps the whole concept of wearable ideology.